Traveling with kids is quite the challenge, but it can also be an immensely rewarding experience. If you are still hesitant to go, though, why not start small by taking your little ones on a virtual tour instead? For instance, let's visit the City of Lights in Toowoo Explore Paris. In Toowoo Explore Paris, kids travel to the magical city of Paris and stroll along a bustling avenue filled with interesting characters, famous landmarks, and other silly surprises. They can stop by the Eiffel Tower and watch a street painter create her art, admire charming Parisian cafes, cheer on cyclists in a bicycle race, and many more. At the same time, they can also learn the names of various things in French and English. There are over 150 interactions and more than 60 characters to discover and play with. Toowoo is an open-ended experience with no right or wrong way to play. Kids can do whatever they want in the app without having to worry about rules, scores, or timer. There are no goals or objectives either. Toowoo Explore Paris brings kids to Avenue Des Toowoo, a lively street lined with quaint buildings and famous landmarks. Kids can scroll left or right to move along the avenue and meet various characters and objects. They can tap on these items to watch funny animations or uncover surprises. For instance, a door might open to reveal a friendly yeti or a colorful dinosaur. At the same time as kids explore, they can also build a small vocabulary in French. When they see a shop sign or a building number, they can tap it and have a narrator pronounce it in French. If they tap it a second time, the narrator will tell them its English alternative. For instance, "boutique" means "shop" and "supermarché" means "supermarket". The app includes numbers from 1-24, and more than 20 word pairs. 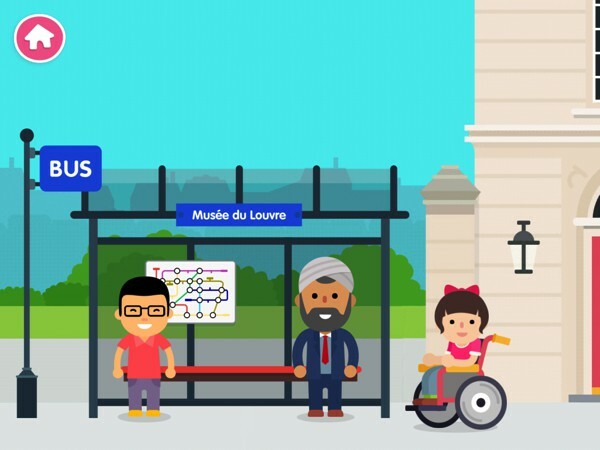 Toowoo Explore Paris is a paid app, which means all the content will be available to you once you've bought the app. It has no ads and no in-app purchases. A protection section, accessible from the main screen, lets parents know about what kids can find in the app. Toowoo Explore Paris is suitable for 2-5 years old. Toowoo Explore Paris is fun, silly, and filled with delightful details. Though it's not an actual travel guide, it's still a great tool for introducing kids to Parisian culture. Older kids will love learning about the names of various things in French, while the younger ones will just enjoy tapping things and watching the funny animations. Many families will appreciate the app's diverse characters: kids and adults, boys and girls, people of different races and ethnicities, people with disabilities, and even non-human characters. There are some quirks about which items are named and which aren't, for instance, at the fruits and veggie stall the cheese is named but the vegetables are not. It would be nice if all the items are named, so that kids can build an even bigger vocabulary. Despite this shortcoming, the app is a great value and bound to entertain kids for quite some time. 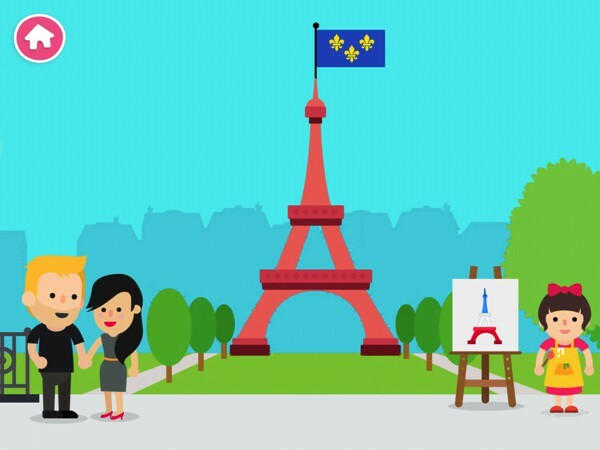 Toowoo Explore Paris is an excellent app if you're looking to introduce your kids to new cultures. This open-ended experience lets kids explore a vibrant Parisian street and discover new people, landmarks, and language. Great for kids under five years old.